Hot summer days are not made for ramen but luckily this summer has been just cool enough to slurp down a few bowls. And what’s more appropriate than the newest addition to the New York ramen scene, Ivan’s Ramen in Lower East? 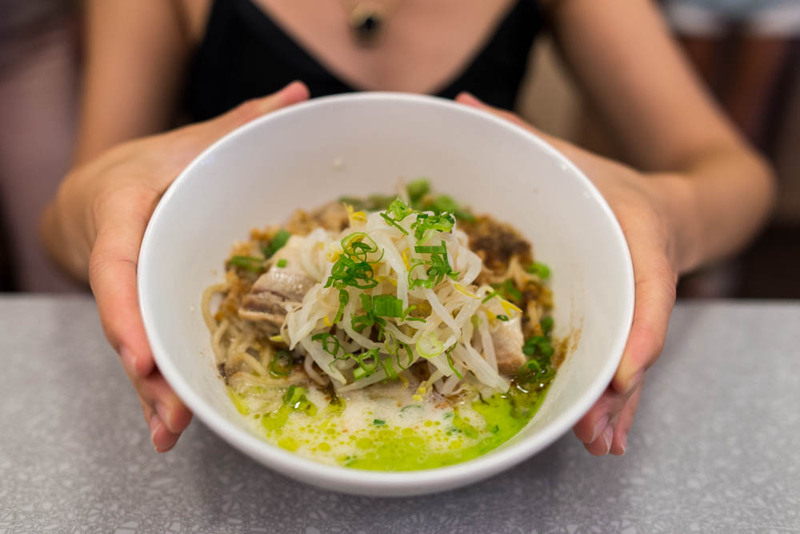 Even though some of the buzz around Ivan Orkin’s more permanent restaurant waned a little with the more casual Ivan’s Slurp Shop in Gotham West Market which opened almost a year ago, Ivan’s Ramen’s expanded menu is well worth a trek all the way to Clinton Street in the Lower East. Unlike Ivan’s Slurp Shop, Ivan’s Ramen features an inspired selection of appetizers. To call them fusion would cheapen the thought and creativity that went into them so let’s just call them innovative. 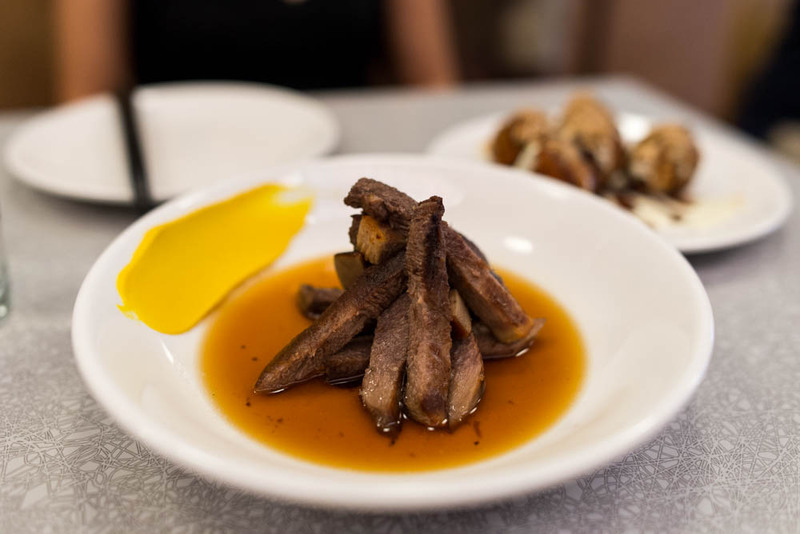 The braised ox tongue transforms the often neglected piece of meat into a savory meaty appetizer. A beef broth adds more beef flavor to the already full of flavor pieces and a smear of vibrant hot mustard cuts the fattiness and might just clear up your sinus all in one bite. The pork meatballs might be small but these little spheres pack a punch of pork flavor. 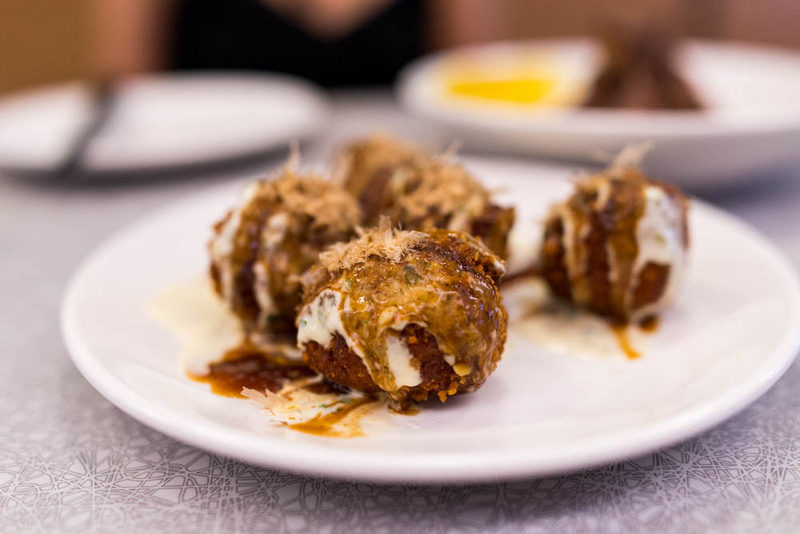 Topped with buttermilk dressing, bulldog sauce and bonito flakes, these only resemble takoyaki. Crunchy on the outside but moist and tender on the inside, the meatballs make the perfect snack with an ice cold beer. Remember the slow cooked pork donburi at Ivan’s Slurp Shop? Well, these are reinterpreted into roast pork musubi. The adorable little bites are the perfect balance of chewy rice, delicious roast pork, salted plum and roasted tomato. The ingredients are packaged neatly into one bite wonders with a thin piece of seaweed, no need for hands at all to enjoy. If you are feeling a little adventurous, go ahead and order the 1000 year old deviled eggs. Instead of your typical combination of mayo and egg yolk, the hen yolks are combined with preserved duck eggs and finished with a dusting of fine bonito. Okay, so these actually sound a lot more crazy than they tasted. The flavor of the 1000 year old duck egg is much more subtle than I was expecting and the bonito flake adds an interesting twist at the end. And for the vegetarian in us all, the tofu Coney Island is wonderfully satisfying. Almost so much so that you won’t even notice that this homey looking dish was completely vegetarian. A savory miso mushroom chili covers little cubes of fried creamy tofu, imparting a meaty flavor. A little bit of yellow mustard which happened to resemble cheese on top of chili and some scallions finish off the creative dish. Even though it’s tempting to fill up on the appetizers at Ivan’s, you must resist. The ramen here stand on their own. 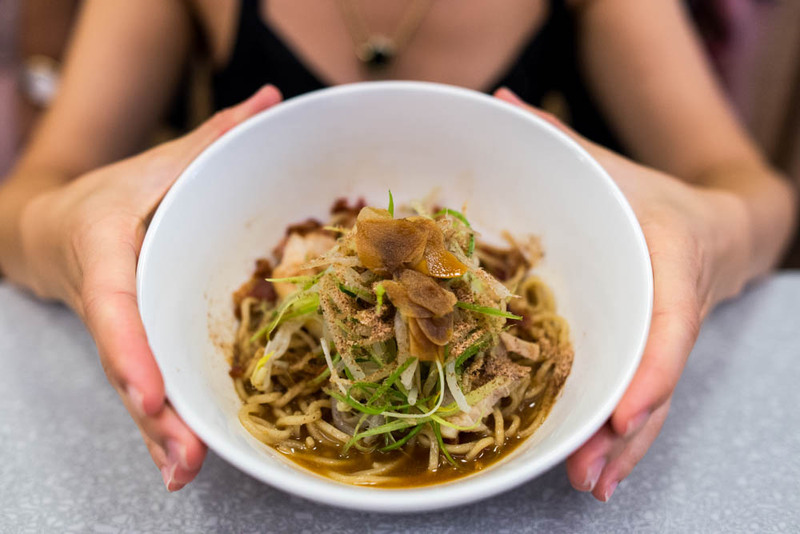 In addition to the classics like shio and shoyu, there are some LES only options that will pull you right in, like this triple pork triple garlic mazemen. Ivan’s signature whole wheat ramen is topped with rich tonkotsu broth and fatty pork chashu with garlic slices and thinly sliced scallions to finish. This isn’t a bowl for the faint of heart but be happy that you made the brave but delicious choice with the triple pork and triple garlic bowl of noodles. In the mood for something a little more interesting? How about a bowl of four cheese mazemen? In this marriage of east and west, Ivan created a wonderfully slurp worthy bowl of noodles and creamy broth. Akin to a carbonara, the sauce is rich but just light enough to sip even long after the noodles were gone. A little bit of daikon and pickled bean sprouts cut the richness and of course, a few slices of the chashu never hurt. 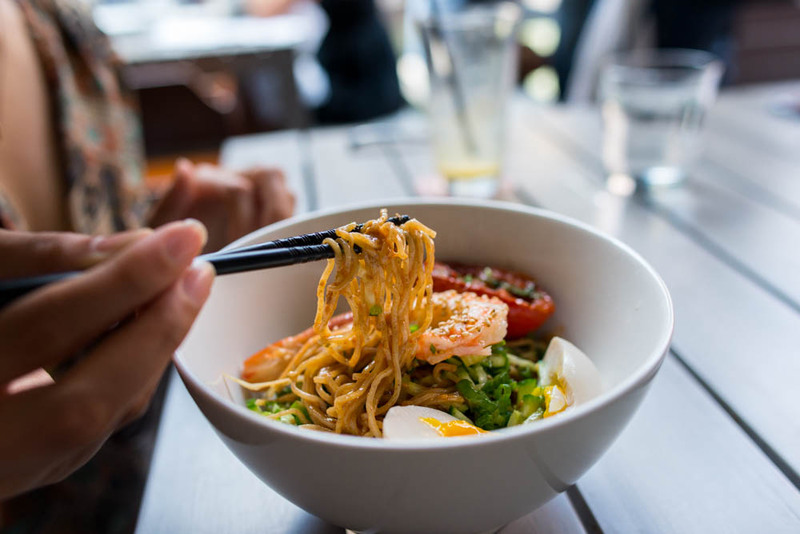 Just in case you find yourself craving ramen on a blistering hot humid day like the ones we had towards the end of August, there are some refreshing options that can only be found on the lunch menu. This is such a shame because the cold lemon shio ramen might have been one of the best bowl of ramens I have had in a long time, hot days or cold. Ivan’s rye noodles hold up their chewy texture in the chilled sea salt dashi broth studded with surprising hints of shiso. Topped with a roasted tomato and eggs in the case of my bowl, this bowl is every bit refreshing as it is filling. Craving a little heat? The bowl of red hot cold mazemen will tickle your fancy with its juxtaposition of heat and cold. The spicy sesame and salted chili sauce coats each strand of the rye noodles and the plump sweet prawns on top with their heads on offer a little reprieve from the heat even though it was just temporary. Even though the sauce might taste mild at first, the heat intensifies with each bite. As you work your way to the bottom of the bowl, just try to lose yourself in the heat and just enjoy because it is just temporary after all. For those days when you are not in the mood for noodles, the hot smoked salmon donburi is a fine choice. 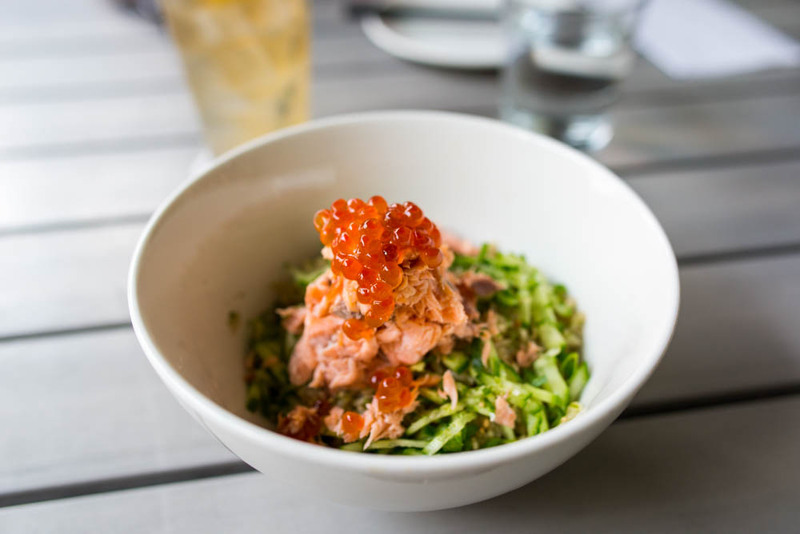 A bowl of perfectly cooked rice is topped with refreshing cucumber, shredded smoked salmon and a beautiful scoop of ikura. The sweet soy dashi dressing is appropriately light for the donburi, especially for a hot day. Just when I thought we had seen and gotten to know what Ivan has to bring to the New York ramen scene well, he surprises us with a new menu at Ivan Ramen. Full of creative appetizers and a few bowls of fabulously addicting noodles, this is well worth a trip clear across town and a little further downtown. Just be sure to stop by for lunch in addition to dinner so you don’t miss out on some of the lunch only options.